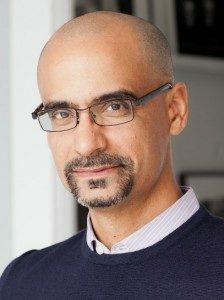 He came to Clark University on Sept. 30 to deliver the President’s Lecture, but novelist Junot Diaz quickly disabused the audience of any notion that his lecture would be like any other delivered within the walls of venerable Atwood Hall. The first questioner asked Diaz his feelings about “living on the hyphen” as a Dominican-American. “One of the strange things is that as an immigrant everyone’s always trying to put frames on what your experience is,” he said, pointing to the fallacy that immigrants are more “conflicted” than other people. “This of course isn’t true. As someone who grew up with a ton of non-immigrants, I can tell you non-immigrants are equally [bleeped] up as immigrants,” he noted, drawing a big laugh. People of mixed heritage, Diaz said, are led to believe that they “only get one shot at the buffet” in American society and must align with a single ethnicity rather than embrace the “simultaneity” of one’s identity, which can include multiple facets that are contradictory. “Instead of being a ‘half’ of something, one might be considered a ‘double’ of something,” he said. “It’s only a country that wants to diminish the contributions of immigrants that comes up with this stuff — that would be every country,” Diaz continued. When a student asked how he deals with writer’s block, he turned the question around and queried the student about her own difficulties with getting words on the page. Diaz urged students not to put “this incredible weight on yourself, like you’re supposed to do everything you want at beck and call.” As an MIT professor, he sees students who can be very hard on themselves. “Most of us do not learn how to drive ourselves through compassion; most of us learn how to drive ourselves through cruelty. … Have compassion for yourself,” he advised. Diaz frankly addressed a wide range of subjects from the questions posed to him, including his use of the N-word in his books and his support of Palestine, which he acknowledged have earned him criticism. But the topic of immigration arose most frequently, with Diaz noting that the U.S. makes a concerted effort to diminish and ultimately erase the immigrant experience from its annals. “If tomorrow we all died and all that was left of us was our television and our movies, aliens of the future would never know immigrants existed,” he said.